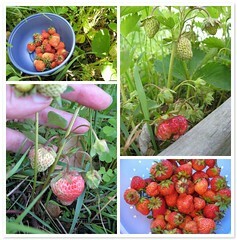 We don't have much of a strawberry patch, especially since I let the weeds take over both this spring and last, but I harvested just enough strawberries in June to make the following recipes at least once. Mash enough sliced strawberries or peaches to fill 1 cup. Reserve remaining fruit. Combine sugar, corn starch and cinnamon in small saucepan. Stir in the orange juice and mashed fruit. Cook over medium heat, stirring constantly, until mixture comes to a boil. Boil, stirring constantly, for one minute. This will thicken into a glaze. Spread half of this glaze mixture over the bottom and sides of the baked pie crust. Fill will the reserved fruit. 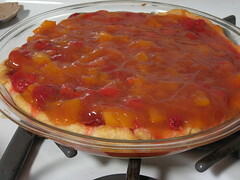 Pour the remaining glaze over the fruit, spreading to cover completely. Chill at least 3 hours. Serve with whipped cream or ice cream.